If your book appears on this page, please edit your information to include the author's full name, rather than the surname and first initial only (except, of course, if it is by the author who used "G. Lenotre" as a penname). Your book should then appear on the correct author page. Please do not combine this page with any of the authors who share this surname and initial. (See "Who should/shouldn't get combined" on the Author wiki page.) Thank you. 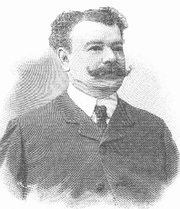 Louis Léon Théodore Gosselin was an influential French historian and playwright who wrote under the pen name G. Lenotre. (The pseudonym was inspired by a famous ancestor, André Le Nôtre, the gardener of King Louis XIV at Versailles.) He wrote numerous articles for periodicals as well as plays and books, specializing in the French Revolution, especially the Reign of Terror. He was recognized and admired for his extensive research using primary documents of the era. Gosselin was elected to the Académie française in 1932, but died before being able to take his seat in the Academy, and never made the speech which he had written in homage to his predecessor, René Bazin. G. Lenotre is currently considered a "single author." If one or more works are by a distinct, homonymous authors, go ahead and split the author. G. Lenotre is composed of 9 names. You can examine and separate out names.